Are you already high-brow ? You don’t want physics, because you didn’t like it at school ? 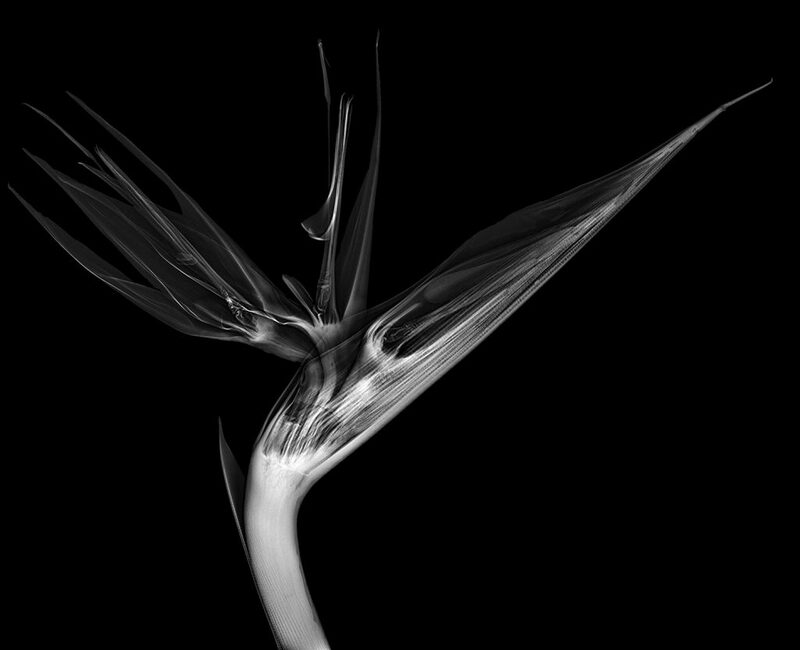 Then take a look at a well understandable FAQ-sheet for x-rays of flowers given by Harold Davis. The doctor advices you to stop reading here ! Those who like some more background may read the following paragraphs. Our eyes are sensitive to visible light. The wavelengths of visible light range from 400nm to 750 nm. Digital sensors for photography are modified in their sensitivity to gain a pleasing image for human eyes. E.g. we like green tones. A digital sensor for photography can be modified in its sensitivity within the range of visible light and over a wider range of wavelengths than visible light. The energy of visible light ranges between 1.6 eV (750nm) and 3.2 eV (400nm). Typical spatial resolutions of photographic sensors in the consumer section are between 4µm and 8µm. A digital x-ray sensor works with spatial resolutions between approximately 70µm and 140µm. Using a medical x-ray machine the available energy levels of x-rays depend on the purpose of a human examination. Energy levels of mammography systems vary between approximately 20 keV and 45 keV, depending on manufacturer. Energy levels of conventional x-rays for bones or chest vary between approximately 80 keV and 125 keV. The corresponding wavelengths are under these conditions 0.06nm (20 keV) down to 0.01 nm (125keV). As you may know, visible light and x-rays are part of the electromagnetic spectrum. Visible light and x-ray differ in their energy. Higher energy of a radiation means higher frequency and shorter wavelengths. Our eyes don’t see other light than visible light. X-rays are a special light then, not to be seen with our eyes – but with a digital sensor. A substantial property of x-rays is their ability to run through objects with mainly no interaction. The x-ray sensor „sees“ only a small percentage of less radiation coming from the x-ray source when an object is placed near the sensor. The left hand image appears normal to your eyes when thinking of an x-ray. Before the digital era, radiologists were using films, an analog medium to produce an x-ray. As x-rays run through an object with mainly no interaction, the dark parts of the left image were fully exposed to radiation. A dark part in an x-ray image therefore was called transparent by radiologists. The parts with lighter grey or white in it were called „opaque“ or „dense“ or „attenuated“ areas. The brighter parts result from the attenuation of radiation by an object. As a matter of convenience, digital x-ray images are shown like the left image. 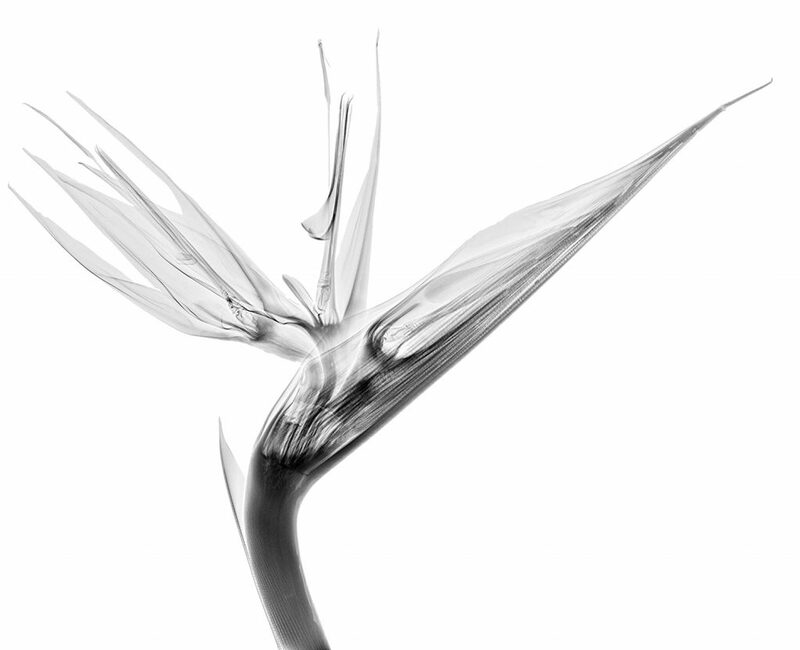 You see already details of the inner structure of our flower, a Bird of Paradise. The right hand image is an inverted grey scale image. Black turns into white, 50% grey stays unaffected and white turns into black. A 75% grey turns into a 25% white. In every photo editor that’s just a simple and easy action to do. The inverted image is more pleasant to the perceptive habits of our eyes. To our experience, the inverted image is preferable for fusion imaging.